If you recall our review of the iOS app Nendoroid Planet a few months ago, there is a section titled “The MUSEUM” with 2 sub-section: “Catalog” and “3D Models“. In 3D Models, we can view the 3D-rendered models of a few Nendoroid. Beside zooming and rotating, we can also take photos of the 3D Nendoroid with our environment as the photo background. 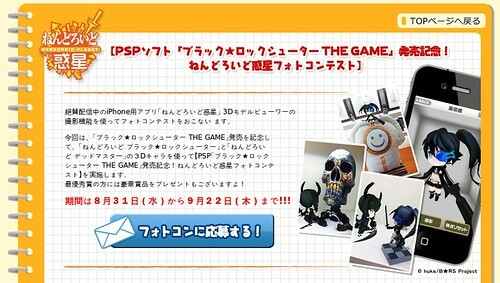 This entry was posted in News and tagged black rock shooter, dead master, nendoroid, nenpla, photocon, planet.